Ritz Drive at US41 northbound to use the Gulfstream modern roundabout’s safer U-Turn feature as in this video simulation of boats on trailers exiting the marina at 1oth Street. (note: the roundabout at 10th is off-center of the signalized intersection it replaces. FDOT to construct circa 2016. The Downtown Sarasota Condominium Association (DSCA) wishes to express its concern for the traffic issues that arise from the construction currently planned at the intersection of Gulfstream and US 41 and along US 41 between Gulfstream and Fruitville. The DSCA welcomes the construction of the condominium and hotels in this area. However, our downtown condominium residents are concerned about the traffic issues that need to be addressed at the intersections affected by this construction. We applaud and support the City Administration’s promise that the city ask traffic engineers to revisit and add to the traffic study of nearby roads (including Sunset Drive) as well as pedestrian traffic. It is critical to all citizens who use the US 41 corridor at these intersections that the traffic issues be resolved. There are 361 residential units in the Cedar Point neighborhood (One Watergate, Sunset Towers, Le Chateau, Lawrence Point I & II, Ritz Towers and the Ritz Residents condominiums). All of these residents are within walking distance of downtown Sarasota but the current and potentially future traffic on US 41 make this a difficult and dangerous walk. We want the city fulfill its commitment to reconnect downtown to the bay front as called for in the City’s Bay Front Connectivity Plan. We request that the city to do everything in its power working with the Florida Department of Transportation to compress the construction calendar and speed the construction of the roundabouts and improved pedestrian crossings at Fruitville and Gulfstream as previously identified in the City of Sarasota Bay Front Connectivity Plan. We also urge the city to develop a pedestrian crossing at First Street that would serve all the residents of the Cedar Point neighborhood. These actions when completed would mitigate the concerns of the citizens of Sarasota and all who use the Gulfstream and US 41 corroder as well as the residents of Cedar Point. J.P. Knaggs, owner of Bijou Café, and Rebecca Hopkins, managing director of Florida Studio Theatre, lobbied the city for First Street improvements, such as wider sidewalks and new decorative lampposts. First Street business owners spent the last year observing the city finalize streetscape projects to improve both Main Street and North Palm Avenue. They wondered when their street would get similar attention. Now they have their answer. A $1.6 million First Street improvement project could start as soon as fall. Merchants say, until now, the city has overlooked the less-traversed street north of Main Street when it comes to sidewalk maintenance, rusted lampposts and aging utilities. According to Rebecca Hopkins, longtime manager at Florida Studio Theatre, it got so bad that it was unsafe for people to walk from the city’s new public parking garage on Palm Avenue to the performing-arts venues on First Street. “There is a kind of divide once you hit this end of downtown,” Hopkins said. But, the project to add new wider sidewalks and plant lush landscaping will put First Street on the same aesthetic level as Main Street and Palm Avenue. In addition to the wider sidewalks and new landscaping, the project will add brick-paver crosswalks, new decorative lampposts and underground power utilities. City officials are also exploring the possibility of building two new roundabouts on First Street, to make it a more pedestrian-friendly corridor. 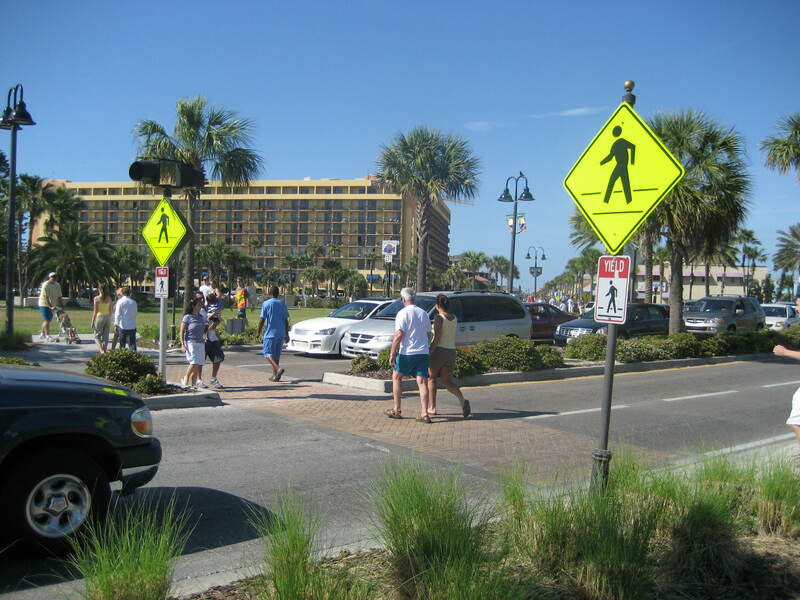 The pair of roundabouts, one at First Street and Cocoanut Avenue and the other at First Street and Pineapple Avenue, would be similar in size to roundabouts that opened in June on Ringling Boulevard downtown. Those roundabouts cost $1.3 million total to construct. Although First Street doesn’t get as much foot traffic as either Main Street or Palm Avenue, the two-block stretch slated for wider sidewalks and lush landscaping is home to FST, Bijou Café and the Sarasota Opera House. It also acts a direct route from the Ritz-Carlton, Sarasota to downtown. Businesses were happy to hear that after years without seeing any major improvements, the city is spending $1.6 million on the facelift. “We’ve been in this location for 27 years, and I’ve been saying for 27 years to the city, ‘How about doing something to our street?’” said Bijou Café owner J.P. Knaggs. The sidewalk improvements have been a work-in-progress for more than four years. First Street was identified as a primary pedestrian gateway in the city’s 2002 Downtown Master Plan. At one point, the city had proposed a small-scale project that would have added potted plants along the sidewalk, said Knaggs. The project grew in scope as Knaggs met with city officials. Last summer, City Commissioner Terry Turner walked down First Street with Knaggs, and the pair noted all the areas in need of sprucing up — including chipped, uneven and pothole-filled sections of the sidewalk, Knaggs said. Hopkins joined Knaggs in some of the meetings with city officials. Hopkins said many of the theater’s patrons are parking in the city’s new Palm Avenue public garage, and new sidewalks and better lighting will make the walk safer. FST recently invested $4 million to renovate the Gompertz Theatre and to build an addition, which includes two theaters and a restaurant. The sidewalk improvements will be a well-timed complement to the new building. FST is also working with city officials so that construction impact is minimalized, while power lines are buried on the theater’s property at the same time the city buries power lines on the city’s right of way in front of the theater campus. The underground utilities will prevent outages that sometimes darken the four theaters on FST’s campus, Hopkins said. Construction work will likely take place as improvements are under way on the proposed public-private hotel on Palm and Coconut avenues, Stancel said. Although construction of both projects could begin as early as fall, the city could end up delaying the work so it doesn’t interrupt peak tourist season. Knaggs said he doesn’t mind if there are some interruptions during season, if it means the facelift will be completed soon. “As long as it gets done,” Knaggs said. The roundabouts on First Street could also provide a directional improvement. Despite the fact that there are two stop signs, drivers mistake the intersection for a four-way stop, expecting other traffic to yield. “I can’t tell you how many times I’ve heard squealing brakes and a smash,” Hopkins said. Painter Frank Creaturo, who has an art gallery at 1269 First St., said just recently the driver of a new Bentley, on her way to dinner with friends, crashed into another car. She seemed confused by which cars were supposed to stop at the intersection, he said.